Sorry for the lack of recipe posts! I realized I hadn't made granola in FOREVER. I had wanted to try something different from the typical varieties I make, so I decided to test out a recipe with quinoa! Success!! about 1/2 cup nuts , I used walnuts and almonds . sunflower seeds also great! In saucepan or microwave melt your coconut oil (combine honey with it if yours it super thick). In the meantime whisk 1 egg white in your large mixing bowl. add quinoa, oat bran, oats , cinnamon and nuts into the large bowl with egg white and mix together. Then add in your coconut oil and honey , mix well. lay out on a pan lined with parchment paper and bake for about 20 min in a 350 degree oven. Tim may vary depending on how big a sheet pan you used and how spread out the mix is, and how hot your oven gets. mix granola half way to make sure all edges get browned a bit. Enjoy! Usage Tip: Great topped over siggis plain Icelandic yogurt with berries (my favorite way to eat it!) or to munch on with morning coffee or tea! Can even be great for a quick pre workout snack on the go, OR mixed with some almond or soy milk for a desert! I made these Healthy Peanut Butter Kisses this afternoon, a new recipe I created that would be both healthy yet satisfying for my husband Jeff! Chocolate Hershey Kisses for topping. Mash bananas. Stir in peanut butter, egg and agave/honey until well combined. Add coconut flour and oats and mix well. Treadmill Workouts to heat you up this Winter! Repeat 2-3 sets. Cool down 5-10 min jog/walk. 2. Tempo Hill Pyramid: Warm up 5-10 min easy jog then right into workout, each effort performed at Tempo Pace (pace that is HARD for 10 miles, or slightly slower then 10k effort) with 2 min easy jog recovery after EACH. ** Beginners can cut the mileage by just completing the pyramid down. 4. Tempo- Fast Intervals: Warmup 5 min easy running, right into workout. Summer is always filled with outdoor parties, BBQ's, Clam bakes, birthdays and getting together for no reason other than enjoying the weather and friends! A lot of times these gatherings include both adults AND kids (especially as you and all your friends start entering your 30's! ), so having a mix of foods that will appeal to a variety of ages is necessary! I never like to come empty handed to a party, so for a recent clam bake I went to I brought these fun treats! Super easy to make and a big hit among kids AND the adults! Mix all dry ingredients in one bowl. Mix wet in separate bowl then add the dry . Add 10-15 drops of green food coloring to the dough and mix until well combined. Add more or less depending on color you want. Either have your homemade green sugar cookies cooled and ready, or mix in your green food coloring with your store bought dough and bake according to directions on package. let cookies cool , while mixing in red food coloring into your white icing. Add less or more depending on color you want. 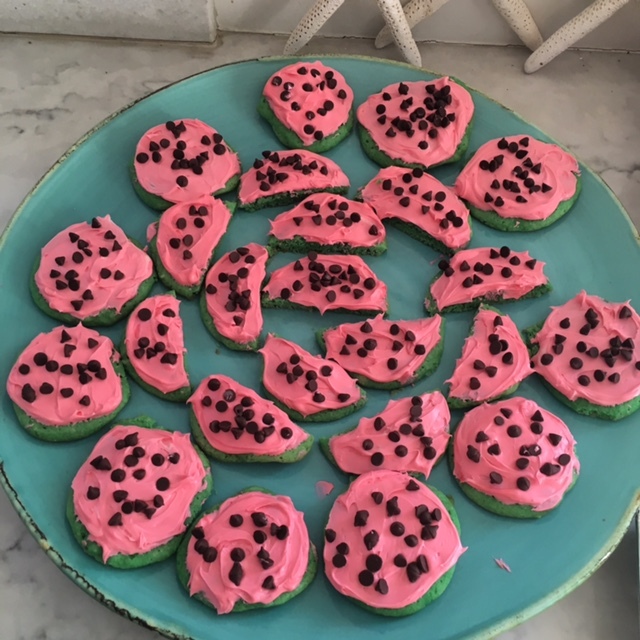 cut some of your cookie in half to have a watermelon like shape. Ice each cookie then add your mini chocolate chips to look like seeds! Eat the RAINBOW takes a whole new meaning (sorry skittles)! Make all your meals as colorful as possible, it ensures you are getting a variety of nutrients! If you are looking for something quick and healthy to make for you or your family, this is a great dish to try! I love to cook, and I find being in the kitchen slicing, dicing, baking, steaming , cooking and cleaning to often be therapeutic and like my own little world of chaos! BUT, there are certainly days where I just don't have the time to dilly dally in the kitchen, and this is where simple , easy prep dishes like this come into play. And did I mention, little to NO cleanup! Set oven to 350 and in the meantime cut up all your veggies and put your quinoa or rice in a pot with water ready to cook. lightly oilyour baking sheet and arrange your veggies on one end and chicken on the other, making sure chicken has some space between pieces for even cooking. squeeze your lime juice all over your chicken and veggies. This is a great meal to make for family, friends, or just you! You can use any variety of veggies you'd like and can even change up the meat you use. I have done salmon before in the same preparation which is a great fish for this one sheet pan meal. You could also make mini turkey or chicken meatballs with it, shrimp, tofu, or simply just roast up your favorites veggies with any spices you like! give it a go! and remember, eating healthy doesn't have to be a chore, just don't be LAZY when it comes to your health! Home stretch of the 8 mile run, with the Goldgate Bridge in the background! The 30mph winds did a number on my hair! Still always manage to smile no matter how much pain I'm in! 1. The challenge it presented to swim the 1.5 miles from Alcatraz in cold, strong waters in which you must be a strong swimmer to complete. Mind you, Alcatraz was built there due to the waters being thought as unmanageable for any inmate to be able to swim across and escape! 2. The unusual distances compared to your typical triathlons. At the pre race meeting on Saturday... thousands of athletes lining the lawn. This race was always very attractive to me because of its longer swim and run in comparison to the bike portion. I am a strong swimmer and runner, and do a lot of trail and beach running which are both part of the run course. The bike is much shorter, but very hilly and technical which I am good at. It also doesn’t allow for people to get that far ahead due to the constant changes in elevation and stop and go of sharp turns. The run course is has many changes in terrain and elevation which are also to my advantage, being strong on hills, stairs and in the sand! Swimming has become my strongest leg, which over the years of competition I have mastered swimming in open water of all conditions, so this race was exciting for me to be a part of. Ending out our 12 mile day of walking through the streets of San Fran! There was a park we walked through with great views above the bay. This is me with Alcatraz Island in the background! Escape from Alcatraz Triathlon is not your everyday race that you can just sign up for on a whim. You have to qualify to get in, which takes being a very serious competitor. For years I had wanted to qualify to do this, but I had never been able to do the one qualifying race that is on the east coast, until last year. I qualified at the Westchester Olympic distance triathlon last September of 2016, and was given a slot to Alcatraz which I had just a couple weeks to decide to sign up for or not! This came with a hefty race entry fee along with all the flight and travel costs to get myself and all my equipment to the west coast. Signing up for races so far in advance always causes hesitation as well, what if I can’t train as much before it? What if I’m injured? What If something comes up? But I signed up of course! We decided we would make a trip of it, kind of like a continuation of our mini- honeymoon we spent in southern California, this time up north! Golden Gate Bridge! What beautiful scenery for a city! From the time I signed up, throughout the 8 months until race day, I kept in good shape and got extremely strong in the pool. Over the years the swim had become my strength, and this year I really felt I stepped it up a bit, swimming regularly with a Masters program and working a lot on my other strokes (butterfly, back and breast strokes that is). I definitely could have biked more, especially over the winter, but that’s pretty typical of me. As for running, that’s always my least consistent, but continues to be my strongest leg! I am lucky to be able to get away with the little run training that I do, but continue to hold strong paces. Beginning of the run, feeling good . Held sub 6min/miles for the 2 miles out to the stairs , trails and beach sections. Then it was all UPHILL from there! Fast forward to June 8, and we are on our way to San Francisco! We land around 8pm and take a short 30 min uber to our air b and b. We were located in the most perfect spot for both seeing the sights of San Fran, and for convenience of being near the race site. We walked about 12 miles the first day we were there, starting with an awesome breakfast at Sweet Maple ( I highly recommend if you are in the area http://www.sweetmaplesf.com/ ) lots of walking to the golden gate bridge park, the race site, Ghiridhelli square and ended with a swim in aquatic park , and an early bird dinner overlooking the bay. Let me just say now, being in bed by 830pm was a trend on this trip! Day 2 entailed all the usual pre-race prep. Picked up my bike from tri bike transport (which was so well worth the $$ to ship it) , got my race bag full of escape from Alcatraz garb and my number, listened to the athlete meeting, cooked dinner at our place and went to bed EARLY. 4am wake up to have a quick breakfast, go to the bathroom and head out. RACE DAY! Was ready to rise, and had no problem getting up to shove food in my face and get out the door! The temperatures out there were cooler than those on the east coast in June, brisk mornings around 55 degrees and highs in the mid to late 60s which would mean it’d be a chilly race. I bundled in my usual sweats and even wore a winter hat. I got to transition area to set up, and head to the buses which would take us to the pier where we boarded the ferry to Alcatraz. A lot of people were wearing booties and extra thick swim caps for warmth. I initially just had my wetsuit, but brought a pair of swim booties just in case. I may be a strong swimmer, but my body doesn’t always react well in super cold water. I had luckily swam in aquatic park 2 days before the race to acclimate a bit, and did so without my wetsuit! I swam about 20 min and I think all the hype about the race being so COLD was worse than it actually felt. This gave me a boost of confidence for when I was to jump in on race day. Taking a swim on Friday at aquatic park right in front of Ghiradhelli Square, with Alcatraz in the background. After a lot of build up about how cold the water was out here, I decided to be like a local and take a swim without my wetsuit! I figured if I could get in without it before the race, Id certainly feel fine on race day. Got in about 30 min no problem.! The San Francisco Belle that I was SUPPOSED to be jumping off!! About 2000 athletes fill the pier and filter their way onto the San Francisco Belle which we would be jumping off of to swim across the bay. There is a feeling of excitement and nerves that fill the air…which is quickly broken by an announcement on the loud speaker. “The coast guard has issued a small boat advisory in the bay…(which was followed by a silence, and then repeated)…The coast guard has issued a small boat advisory, and the conditions are too rough to allow the swim portion of the race to go on, the swim has been cancelled , and all racers must exit the boat.” I think I saw a sense of relief on some faces and major disappointment in others, mostly disappointment as this race is really all about the swim! Never in the 30 years of doing this race has the swim ever been cancelled! I knew the water would be rough, as that is the premise of the race and Alcatraz island being placed where it is! But, the conditions that morning were unlike days in the past. The kayakers couldn’t even get out into the water to their positions because they were being blown over and white caps coming up over the boats. Supposedly there had been unusual currents in the bay this time of year due to the weather and runoff into the bay. There was no way they could throw 2000 people into the water. I was completely shocked and bummed out. I really wanted to see how I did on this swim. They held the bike and run portions, starting with a TT bike start. This took a bit of time to get organized. Once I set off on the bike, it was a weird feeling to not be soaking wet and a little frazzled from a hard swim. 30mph winds were blowing at us while we biked. At one point I was going downhill and not moving! This made for an even slower bike time then I usually have! Once I hit the run though I felt in my element. I went hard the first 2 flat miles and passed the most people on all the hills, sand stairs and beach portions as this is my strong suit. I ended up having one of the fastest runs among BOTH women and men AG! Jeff and I after the race! After the race it was SUPER windy and all I wanted to do was get some food and move on with our trip down the coast! Jeff and I had rented a car and drove down to Carmel by the Sea, about 1.5 hrs from San Fran. We stayed in a great hotel called The Hideaway (highly recommend) which was one of many quaint, cozy inns nestled in the main town. We stayed here for three nights and covered every square inch of town and coastline during this time as we were on the go every day! We filled our days with lots walking, hiking and biking (oh, and Jeff would include eating as well!). One of our favorite days was biking to a great hiking area called Point Lobos, about 6-8 miles from the town of Carmel that covers the most spectacular coastline I’ve seen. We biked there, hiked 8 miles and biked back. To end the day we had a great dinner at a Ranch outside of town called Mission Ranch Inn. It was a perfect mix of farm and beach (my two favorites), overlooking a field of sheep that leads to the ocean. We had a nice dinner on the porch watching the sunset. A perfect way to end our last night in Carmel! Coastline of our hike in Point Lobos! Highly recommend to anyone visiting that area. The water was the most beautiful hues of blue I've ever seen! Pictured above: how to hold kettlebell/weight for goblet squats. In this circuit I added a overhead press . Today I did a long, hilly run outside, which I followed up with a quick 20-30 min full body workout. See below! This was a good workout to tack on to a run as it challenged my anaerobic system and muscle groups that I didn't utilize running. I typically always like to do a good core workout after most of my swim, bike, runs as a strong core is the powerhouse to everything else I do, and can be challenged most every day! Although these may not be the most photogenic of cookies….I had many requests for the recipe! My husband loves chocolate chip cookies, but I am often stuck between wanting to make him the good old fashioned, unhealthy ones and recreating recipes to make them super healthy! Often enough, I make a healthy version, and they are just as good as the traditional! Mix all wet ingredients together in one bowl, and dry ingredients in another. Combine and add the chocolate chips and coconut flakes. Scoop into balls and lay on a parchment lined baking sheet. I lightly flatten each with my hand so that they bake evenly. These cookies are full of flavor and nutrients! It’s all you want in a chocolate chip cookie without the excess sugar, fats and “empty” calories from white flour. After baking, I let cool and store in the fridge! Eat well and feel well!! I have many favorite things, most being athletic gear such as my bikes, running shoes, swimsuits and most importantly my goggles. There is nothing worse then being midway through a swim set and getting a leak in your goggles, or leaving the pool with a nagging headache from how tightly you had to keep them just to stay on your head (permanent goggle marks are inevitable for me anyways!). Even worse, is to have this happen during a triathlon while being swarmed by hundred of knuckleheads in the open water! To me, there is nothing better then a good pair of goggles, ones that don't leak, suction cup your eyeballs out of your head, or pierce the inside of your nose with their oddly shaped lenses. Back up to my backups of Nest Pro goggles thanks to my team at TYR! I have been wearing these goggles for as long as I have been in the sport of triathlon, which is about 9-10 years now! And to attest to how great they are, I don't think I have gone through that many, and still have one pair that I first started with , that has polarized lenses for sunny open water swimming (and I still use them!). I have worn them in many of their varieties of lenses. The polarized are much needed for early morning open water swimming when the sun is bright and any outdoor swims, the clear and light blue lenses are great for indoor pool swimming, My favorites are the ones pictured above with the light blue lenses. It brightens things up just so slightly and is great for both the pool, and overcast days at the beach (or any open water!). Endurance Eats: Banana Oat "Cookies"
**This batch was made with the addition of peanut butter and peanuts to top! Looking for a healthy treat to satisfy a sweet tooth? or a good pre- workout fuel that isn't full of additives, sugar, artificial sweeteners or preservatives? Try these simple and nutritious cookies made with just 4 ingredients: Bananas, oats, egg whites and cinnamon. They may be shaped like a cookie, but certainly are better for your body as they are filled with fiber, natural sugar from the bananas, protein from the egg whites and a blood stabilizing affects from the cinnamon. Mash bananas in a large boil, add in egg whites and mix well. Add in oats and cinnamon , and optional coconut oil for added fats. lightly grease a baking sheet and spoon out mixture into 1 1/2 inch rounds . Bake for 10-12 minutes. I use "Recovery" loosely here! This was still a solid swim, however it was my one workout for today and I integrated a lot of varied intensities and strokes to just keep my body moving and to stretch out every angle of my body! Swimming is the ultimate recovery tool for me, especially after hard or long bike , runs or strength workouts that leave my muscles tight and sore. Even a hard swim can be considered "recovery" simply because its giving the body a break from anything weight bearing, and is easier on the joints. I typically swim 5 days a week, and although a good hard swim workout will leave my arms quivering and body fatigued, I can still get in the next day and be able to complete another good workout using different intensities/intervals, strokes or tools such as pull buoys/paddles and fins. This is why I love swimming so much, there is so much to be improving on and so much you can do in the pool!!! This was a great mix for today. I was able to get a good 1500 straight to start off, then worked a little of my anaerobic system with some 50 sprints to get the heart rate up. The 12 x 75's with stroke mixed in really helped loosen up my legs and work different muscle groups. This would be a great swim to do after a Long Run day or race! In need of a good "Detox" or "clean up" after a Christmas full of more then a few cocktails and indulgences? This soup is for you! It may not look as appetizing as your holiday dessert spread, however it will certainly get you back on track to feeling healthy and strong! Its an all you can eat soup as its super low calorie and loaded with nutrients, fiber and contains no salt, fat or JUNK ingredients that soups you buy at the store often have. This is a great recipe for a meatless Monday, cold winter day, and even better for helping get rid of that nasty head cold as it is loaded with nutrients and will warm you from the inside out! Not only is this recipe a nutrient powerhouse that will ensure you get in all your vegetable servings, but it is also very easy to do! The two necessary items you will need are a large soup pot and an immersion blender or Vitamix (or any large blender) . I use my vitamix! 1. In large soup pot , simply add all your vegetables and enough water to cover it all. Bring to boil and let cook for about 10 minutes til the vegetables are softened. Turn off the heat and let it sit for 10-15 minutes. I've been on a kick the past couple of weeks about sharing my swim workouts. I enjoy creating new sets to try. It beats just getting in the pool with no "plan" and certainly helps the laps go by faster (literally!). Here is what I did today, I will break it down a little better for you! This was a fun workout that flew by. I often like to get in and just swim straight 1000+ as a warmup...I think it shows why I love to swim so much because I feel like I can just get in and go forever, on cruise control, just me and my thoughts. Its a constant counting of laps, strokes and a jumble of many thoughts, and I find being surrounded by water to makes it so peaceful. Today I was feeling a bit ehhhh, but still wanted to get the yardage in. I did the first two rounds of main set 1 all freestyle, focusing on increasing my pace as the distance shortened. Then the last two rounds I did pull, which I always find much "easier" then just swimming... The last 9x 100s were a good way to work on tired arms, and good practice for triathlon when you should be more upper body dominant , and getting used to swimming after that added resistance. The IM was just a killer add on :) Enjoy!